“I always tell them, ‘thank you for coming in’ and, ‘you’re quite welcome,’” Mervin says. 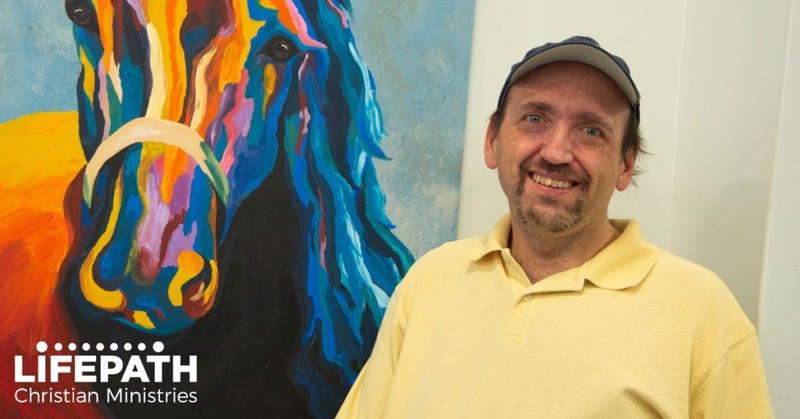 Mervin, a Stewartstown resident with special needs, has been a participant in several of Penn-Mar Human Services’ programs and started volunteering at LifePath one year ago. Penn-Mar and LifePath formed a partnership where people like Mervin in Penn-Mar’s programs volunteer at the food pantry. The partnership gives LifePath access to more volunteers while giving Penn-Mar program participants a chance for community inclusion. Outside of volunteering, Mervin works cleaning a camp in New Freedom three days a week and helps to teach safety training to other program members at Penn-Mar. Mervin spends one or two days per week at LifePath. Some days, he makes sandwiches and serves soup, while other days he preps for meals and helps clean the facility. Penn-Mar helps him get to York by providing transportation from Glen Rock into the city. Mervin says he looks forward to volunteering every week. This entry was posted in Blog, Stories-Post. Bookmark the permalink.